AS RECENTLY AS last week there were doubts about Ireland’s ability to secure a deal on the promissory notes that would avoid payment of €3.06 billion due at the end of March. But on Wednesday evening things changed dramatically and within 24 hours Irish Bank Resolution, formerly Anglo Irish Bank and Irish Nationwide, had been liquidated and the promissory note arrangement was no more. It was replaced with a series of bonds whose repayment will be stretched out over a longer period with lower interest rates. It has been hailed as a significant change in Ireland’s debt situation and at the same time criticised as kicking the can down the road. 4.30pm: Reuters news agency reports that the Irish government plans to liquidate IBRC as part of a deal it is seeking with the European Central Bank to reduce the onerous promissory note payments. Citing a source familiar with discussions Reuters says Central Bank governor Patrick Honohan plans to put a revised plan to his fellow central bank governors at a meeting of the ECB general council in Frankfurt. 4.45pm: Bloomberg also reports the news as speculation mounts that a government announcement is imminent though the Department of Finance declines to comment. Tánaiste Eamon Gilmore subsequently told RTÉ on Friday morning that he was satisfied the leak to Reuters and Bloomberg did not emanate from Dublin. 4.52pm: RTÉ’s David Murphy reports that the government plans to liquidate the former Anglo Irish Bank (IBRC) “as part of steps to replace the promissory note” and says the Central Bank will take over the IBRC balance sheet but the deal hinges on the ECB. 5pm: Reports emerge that Finance Minister Michael Noonan is to address the Dáil on the issue this evening and that TDs and senators have been told to expect late sittings. 5.24pm: Labour TD Kevin Humphreys says that TDs have not been told that the Dáil is sitting late “lots of rumours, no substance yet” he says on Twitter but at 5.42pm Fine Gael senator Fidelma Healy-Eames says there is a “long nite (sic) ahead”. 6.30pm: With a view to being needed to sign emergency legislation President Michael D Higgins departs Rome Fiumicino airport, where he had been on an official visit to Italy, bound for Dublin. 6.30pm: Detail begins to emerge of the potential IBRC liquidation with Kieran Wallace of KPMG appointed to liquidate the bank. IBRC Chairman Alan Dukes confirms that he and the board have been stood down. It later emerges that he first learned that the bank was being liquidated via a journalist. 8pm: It emerges that the Cabinet’s Economic Management Council of the Taoiseach, the Tánaiste and Ministers Noonan and Brendan Howlin met to discuss the latest developments. Noonan later confirms that once the news of the IBRC liquidation had leaked the decision was taken to press ahead with the liquidation process with a view to getting a deal with the ECB, the plan was codenamed ‘Project Red’ by the Department of Finance. Around this time, Bloomberg reports that the ECB wants more time to consider the Irish proposal on promissory notes and that no decision will be taken tonight. Ministers are notified of an emergency Cabinet meeting to take place tonight. 8.30pm-9pm: An hour into a debate on a private members motion on the promissory note in the Dáil chamber and with a Cabinet meeting getting under way in government buildings, the Government chief whip Paul Kehoe confirms to TheJournal.ie that the Dáil will sit late, beginning at around “10 or 10.30pm”. 9.58pm: The Cabinet continues to meet as TDs vent their anger on Twitter at the late notice of the emergency sitting and the fact that they haven’t yet seen any legislation to liquidate IBRC. 10pm – 10.25pm: Opposition finance spokespersons begin to get a briefing from Michael Noonan on the detail of the proposal. There are still no copies of the bill that is supposed to be debated when the Dáil resumes at 10.30pm. 10.30pm: The Dáil resumes but is suspended until 11pm to allow more time for briefings and for legislation to be distributed among all TDs. Copies of the Irish Bank Resolution Corporation 2013 Bill is placed in deputies’ pigeonholes. Opposition finance spokespersons continue to receive a briefing as the rest of the Dáil members consider the content of the 58-page bill which only exists in paper form at this time. A timetable of planned proceedings is tweeted by Independent TD Thomas Pringle. 11pm: Dáil resumes and chaos ensues as TDs wrangle over what time to adjourn until with the Taoiseach prepared to go to 11.30pm but the opposition roundly rejecting the idea. 11.16pm-midnight: Having eventually agreed to adjourn until midnight, Twitter – with #promnight trending – is abuzz with quick-fire analysis of the legislation with an electronic copy becoming available. Gerry Adams describes the government’s approach as “a shambles”. His fellow Technical Group member, independent Stephen Donnelly questions the constitutionality of sections of the legislation on TV3 before rushing back in to Leinster House to debate it. Stephen Donnelly speaking to Vincent Browne on TV3. Pic: Laura Hutton/Photocall Ireland. As soon as the information relating to the proposal to liquidate IBRC was made public, there was an immediate risk to the bank. Given this position, I as Minister for Finance, took immediate action to secure the stability of the Bank and the value of its assets, valued at €12 billion, on behalf of the State. 12.15am-1am: Finance spokespersons from the opposition parties raise various questions about the bill and the timing of its introduction. Fianna Fáil’s Michael McGrath cautiously pledges his party’s support for the bill while Pearse Doherty accuses the vast majority of government TDs of not having read the legislation and says his party will not be supporting it. We cannot vote for this if we don’t know the other part of the package. That is the problem with this bill. We are being asked in isolation to approve the liquidation of the bank, which we might approve of, when we don’t know the other part of the package tomorrow. 1am-1.55am: The Taoiseach, the Tánaiste, Micheál Martin and Gerry Adams, all address the Dáil outlining their varying positions while we also hear from independents Mick Wallace, Luke Ming Flanagan, Catherine Murphy and Thomas Pringle. Did you ever hear of a liquidation that was announced one day, but not carried out for several days or weeks? If that isn’t done, creditors will line up to strip the company of everything they can lay their hands on. 2.05am: A vote is called. 2.18am: The Dáil votes by 113 votes to 36 to approve the second stage of the Irish Bank Resolution Corporation Bill. 2.20am- 2.44am: More debate on the legislation with questions about whether IBRC employees show up for work the next day (they do but are later told by the receiver that their contracts are being terminated). 2.44am: Another vote is held on the final (committee) stage and and the bill is passed by 113 votes to 35. Here is how each TD voted. 2.55am: With the Bill approved it heads down the corridor for debate in the Seanad and the Dáil is adjourned until 1pm. 3.06am-5.14am: Debate gets under way in the Seanad with a row and then a vote on the procedural arrangement which limits the debate to two hours. In that time Fianna Fáil senator Marc MacSharry likens the IBRC Bill to Hitler’s Enabling Act. 5.16am: Second stage of the IBRC Bill 2013 passes the Seanad by 37 votes to 6. 5.17am – 6.05am: More debate on the Bill in the Seanad. 6.07am: The bill passes the final stage in the Seanad and is dispatched to Áras an Uachtaráin to be signed by the President. Heavy-eyed senators and journalists depart Leinster House after the longest of nights. 7.11am: A statement from Áras and Uachtaráin confirms that President Michael D Higgins has signed the Irish Bank Resolution Corporation Bill 2013, which provides for the liquidation of the bank formerly known as Anglo Irish Bank, into law. Explainer: What happened last night? Why was IBRC liquidated? What happens now? 7.30am – 9am: Attention turns to what decision the ECB’s governing council will make as its meeting begins in Frankfurt. Junior finance minister Brian Hayes tells Morning Ireland that the government made the right decision to liquidate Anglo and that he is “confident and optimistic” that the ECB will agree to the proposal. Concerns are raised about the future of the over 1,000 people working at IBRC around 900 of whom work in Ireland. Larry Broderick, from Irish Bank Officials Association, complains about the lack of notice and information about the liquidation. He describes the treatment of staff at the bank as “horrendous”. The email circulated to all IBRC employees by the liquidator. Pic: Mark Stedman/Photocall Ireland. 9.07am: Bloomberg News reports that the governing council is unlikely to make a decision on the promissory notes arrangement today, citing sources as saying some members of the council want to discuss the plan with officials at their own central banks first. 12.19pm: Reuters reports that the ECB and Ireland has reached a deal. “A deal is done,” a source tells the news agency. The Department of Finance refuses to comment and says there is no indication as to whether Michael Noonan will be making a statement on the matter. 12.49pm: RTÉ reports that a deal has been concluded with the ECB that will require agreement from the Cabinet which is scheduled to meet at 2pm. The Irish Times quotes Irish sources as saying that a deal has not yet been reached. 1pm: The Dáil resumes with Education Minister Ruairí Quinn saying: “We have not received formal confirmation of precisely what is to be agreed and when we have that information, the Government will resume. TDs voice concern in the chamber about the lack of debate and information on the issue. “This parliament is losing any sense of sovereignty it had,” Micheál Martin tells the Dáil, because of the “disconnected way the executive is behaving”. 1.45pm: Press conference gets under way in Frankfurt with ECB President Mario Draghi reading a statement confirming that eurozone interest rates remain unchanged at 0.75 per cent. There is no mention of Ireland in the statement. 1.51pm: Taking questions Draghi is asked about the Irish situation but says that no decision was taken at the governing council meeting, only that the council “unanimously took note of the Irish operation. I will refer you to the Irish government and the Central Bank for details”. “It’s the Irish government and Irish Central Bank actions and we took note of these actions,” he tells the confused media. Immediately, doubts emerge as to whether there is any deal. 1.55pm: RTÉ cites official sources in saying that Draghi saying that the ECB “took note” of the deal was a means to say that a deal has been agreed. 2pm: Cabinet meets and Taoiseach expected to address the Dáil at 2.30pm. 2.10pm: Draghi continues to stonewall questions about a deal for Ireland in the face of persistent questions from journalists. 2.30pm: No sign of the Taoiseach in the Dáil chamber. 2.40pm: The Department of Finance issues a press notice inviting the media to attend a press conference and technical briefing on the “Revised Promissory Notes Arrangement” at 4pm at government buildings, indicating a deal of some sort is done. 2.52pm: Taoiseach Enda Kenny arrives in the Dáil and informs the house that “the annual promissory note payments are gone”. Opposition reaction ranges from a “qualified welcome” out of Fianna Fáil to Sinn Féin’s view that the government has “turned a €28 billion promissory note, the cost of Anglo Irish bank, that toxic debt, into a €64 billion sovereign liability to this State”. 4.09pm: Planned press conference with Michael Noonan and Brendan Howlin is delayed menawhile Central Bank head Patrick Honohan declares himself “satisified with the arrangement”. Noonan goes through some of the technical aspects of the deal which is followed with even more technical information from Department of Finance Secretary General John Moran later. In a bid to explain the deal in simple terms he describes how he bought his house in Limerick in 1968 at a cost of IR£3,200 and when the mortgage ran out 25 years later, one month’s pay as a teacher would have paid for the whole house. And with that, 24 hours of chaos, confusion, rowing, late nights and cryptic press conferences came to an end with a deal that means the promissory notes are no more. 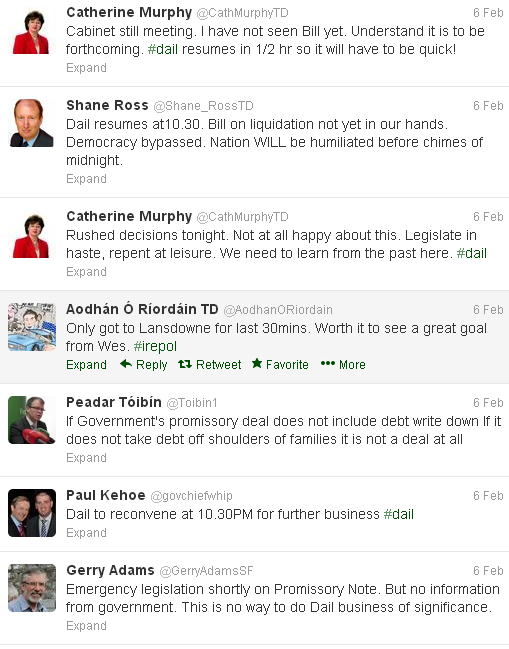 Poll: Did the government get a good deal on the promissory notes? Column: Will the young pay for the sins of the old under the promissory note deal?